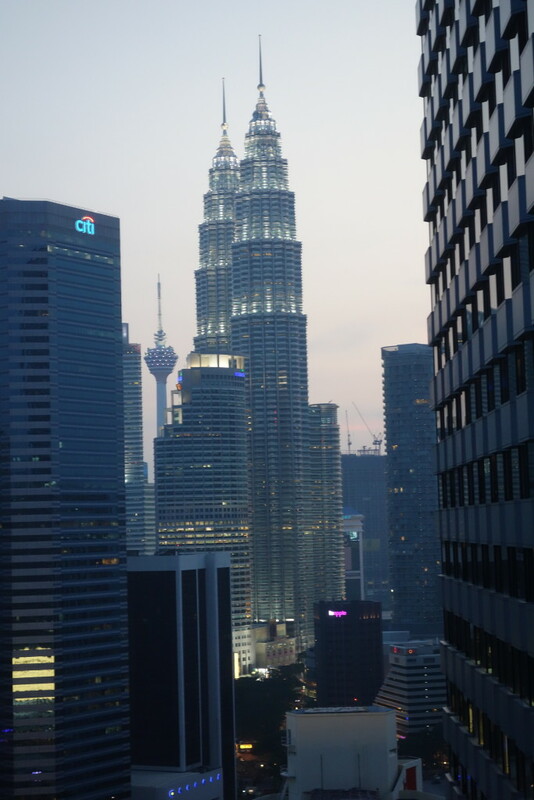 For my short trip to Kuala Lumpur, I stayed at the Hilton Doubletree. As a Category 2 hotel, it’s only 10k Hilton points per night, which is a great deal, especially as a Gold member when you can get free breakfast and lounge access. Anyway, no upgrade on room besides getting lounge access, but that’s about all I would need/want when I’m traveling by myself. My room was a standard, well-appointed hotel room in Asia by a Western brand. The hotel had a pretty nice fitness area. I’m not 100% sure on this, but I believe it acted as a health club/gym that outside people could pay to have access to. The executive lounge offered both breakfast and evening canapes and cocktails. I don’t really drink, but apparently, free alcohol is kinda a big deal in Malaysia because of alcohol taxes. I enjoyed eating the snacks, though. Breakfast in the restaurant was pretty crazy. The restaurant is massive and has a number of different sections representing different cuisines. For example, there’s a Western section with things like pancakes, eggs, bacon, and waffles, but there’s also a Chinese section with dim sum, a Malaysian section, and an Indian section. This was by far the biggest breakfast buffet that I’ve been to. Overall, I really enjoyed my stay at this hotel. It’s a great redemption value in the Hilton program, and if you’re a Gold member, you can get access to an awesome free breakfast and lounge access. I would happily stay here again if I find myself in KL. This entry was posted in Hilton, Hotel Reviews, Travel, Trip Reports and tagged hilton, hotel review, kuala lumpur, travel, trip report on July 7, 2015 by Edward. Is this the best Hilton value in the world, assuming Gold status? I think the value (10K pts) and room condition is amazing. Did you get the warm and fresh baked cookies upon check-in? Love the hotel, exe lounge and the breakfast room. We always stay here, every time we visit KL. Walking distance to PETRONAS and KL Suria Mall. You mean the executive lounge offers free alcoholic beverages? Yes, that’s correct. Or at least it was true as of the time of that visit. Question, how did you get lounge access as Hilton Gold? Isn’t it a Diamond only feature?